MetaMuseum was a three-month experiment in collaborative digital curation, edited by Alexandra Lange and sponsored by the Museum of Arts and Design (MAD) as part of its Spring 2013 series After the Museum: The Home Front. Lange asked curators at 13 American museums with design, craft and architecture collections to send images of exhibited works corresponding to 12 themes, along with brief captions. Each week, the Tumblr displayed a set of objects, installations and graphics illustrating that theme, spanning media, time, space and production. Themes included Alphabet, Children, Eat, Liquid, Tiny and Weave. 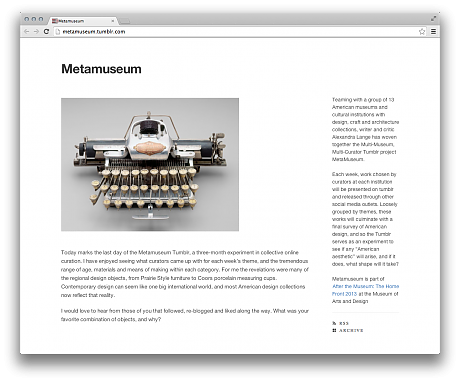 The Tumblr was intended to explore the depths of those museum’s collections, the breadth of interpretation possible for a single word, and the broad tent that is modern design. The site remains active as an organized, idiosyncratic slice of the visual history of the last 150 years. Participating institutions included the Art Institute of Chicago, Carnegie Museum of Art; Cooper-Hewitt, National Design Museum; Denver Art Museum; Milwaukee Art Museum; Minneapolis Institute of Arts; Museum of Contemporary Craft; Museum of Fine Arts, Boston; Museum of Modern Art; Racine Art Museum; Walker Arts Center; and the Wolfsonian-FIU.